This is one of the most familiar features of the Moon as viewed from the Earth. What we are seeing is the Moon’s monthly orbit around the Earth (aka the synodic revolution), which starts with the New Moon and takes 29 days, 12 hours and 44 minutes. When new, the Moon is positioned between the Earth and the Sun (1) – thus, the illuminated area of its surface is not visible from Earth. This phase is symbolically represented by a black disk. As the Moon progresses on its orbit, it reflects a crescent of light that expands until it is seen from Earth as a luminous disc – the Full Moon (2). In this phase, the Moon is on the opposite side of the Earth to the Sun. From that point on, the illuminated area decreases until the Moon renews its orbit once more. The Moon ‘waxes’ during the phase from New Moon to Full Moon – the illuminated area increases in size every day. 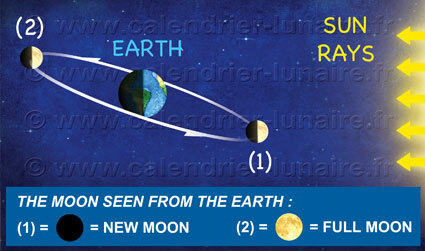 The Moon ‘wanes’ during the phase between the Full Moon and the next New Moon. Every night the illuminated area becomes smaller. When observing the Moon in the northern hemisphere a quick glance will let you know if it is waxing or waning. When you can draw a ‘p’ with an imaginary stroke and the luminous crescent, the Moon is waxing, (p as premier in the meaning of increasing). when you can draw a ‘d’ then the Moon is waning, (d as decreasing). In the southern hemisphere, it works the other way round as the image is reversed : when the Moon is waxing you can draw a ‘d’ and when it is waning a ‘p’. People who live close to the equator see the moon lying on its side.